How amazing … we got to Week 6… and wasn’t this week fun! Learning the bump back feather is a nice technique and and I think if you have some success with this type of feather, you can practise it over and over, challenge yourself to create it in different shapes, understand the value of seeing how other people tackle feathers in strange shapes (by seeing quilts at shows, or on social media and Pinterest) and ultimately it will give you the confidence you need to try other methods of creating feathers. The sew up for this week is below. However, I just wanted to say a few things about this challenge. 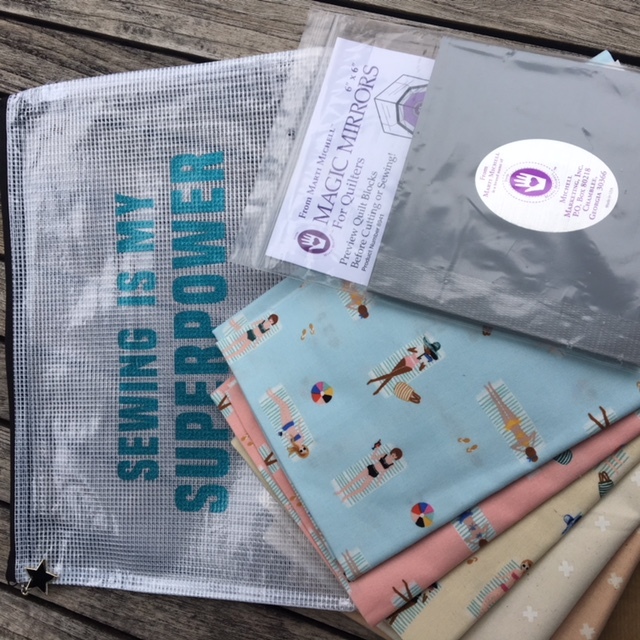 I developed this challenge to keep my home sewing ladies engaged with sewing over the school summer holidays because for family reasons I wouldn’t be able to teach or hold my normal summer BBQ for the GillyMac Crew (an often raucous affair that Brian stays well away from). In the ridiculous heat of the early summer, I filmed the doodles and started sewing them up. I did worry if people would be interested. The Challenge has given me hours of pleasure. The best thing has been the community YOU have created around the Challenge and the encouragement YOU have given each other. I have roared with laughter at the photos of Jupiter (Lindy’s cat), Billie (Carolyn’s friend’s horse) and Terry (Sue’s dog) all getting in on the action and thrilled that so many people doodled across Europe on holiday as well as being part of the core challenge. Unbelievably the videos have had >5000 views and this is still increasing. One of you asked me why I did this for free. Well, I did it to try out delivering information by video (thanks for putting up with my learning steps) and I wanted to see if I could build a community. I hope that if you have enjoyed this, you will naturally tell others or share posts. Keep practising the doodles as we will use them in the October Fiesta 🙂 …. Only one week left and it is a good time to reflect on what you have learnt through the challenge before you forget it, and before we have some creative fun with feathers. To start with you need to give each doodle a name – you can make your own up (or you can use my names – downloadable below) and then my suggestion is that you use this grid (also downloadable below). The grid has two axes. One is ‘how much you like the doodle’ and the other is ‘how hard it was’. In the example below I have added in my (pretend) thoughts …So … I found doodles 1. 3. 5. 6. 7. 10. 11. and 12. EASY to Doodle and I LIKED them. I found doodles 4. 8. 9. 13. 14. 19. 20. and 25 HARD to doodle but I LIKED them. I found doodles 2.15. 16. 21 and 22 EASY to Doodle but I DISLIKED them and I found Doodles 17. 18. 23 and 24 HARD to Doodle and I DISLIKED them. 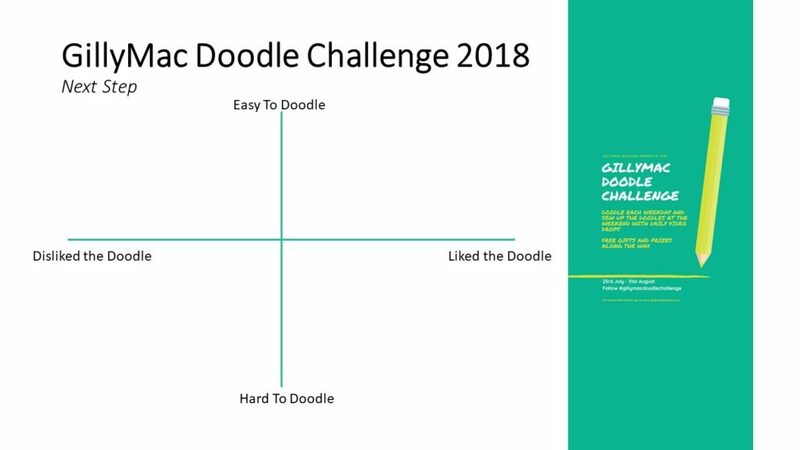 I hope that from this example you can see how you can map your likes/dislikes and how tricky you found the doodles onto this grid. Now you can put your doodles numbers where they fit for you. 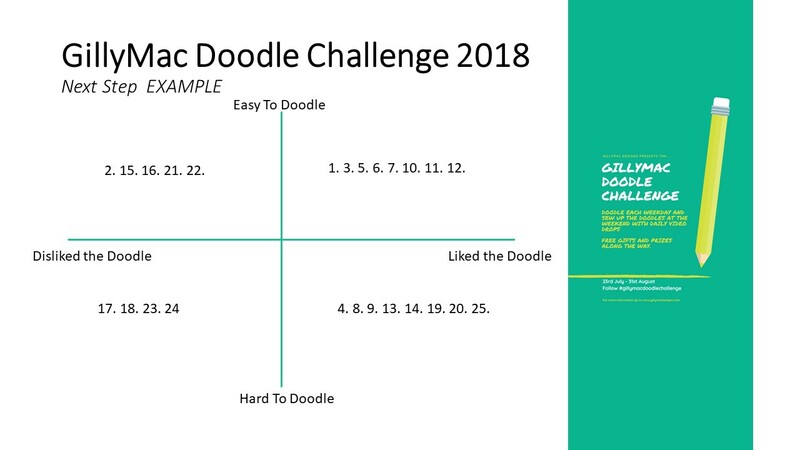 Everyone’s grid will be different as we all liked different doodles and found specific ones harder than others. From here it is really easy to make of plan of what to do next !! The chart below shows you what you need to do. Some doodles you can just forget (bottom left) … others you should actively use now on your sewing to get them nailed in your free motion repertoire (top right), others you can continue to doodle until you find them easier (bottom right) and then there are some in the top left box that you may find a use for in the future so keep them on the back burner. You may find that in 6 months time the place you have put the doodles in now has changed. So this is something you may want to revisit. 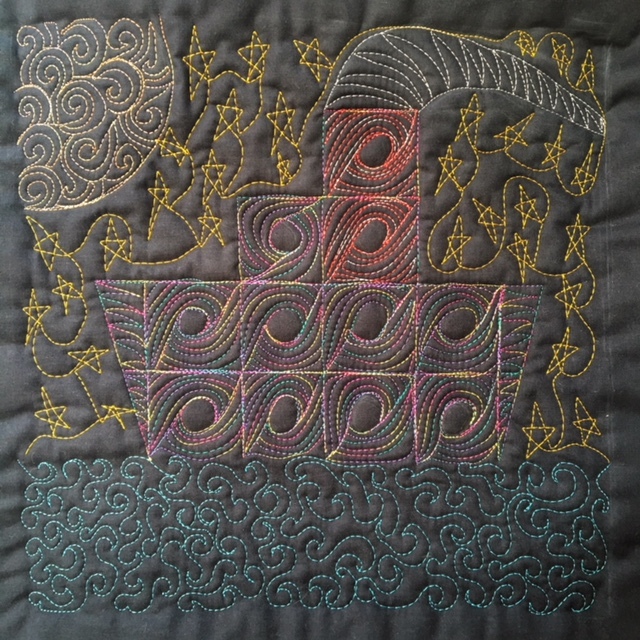 For now – here is the Sew Up for this week… My Ullswater Steamer Ferry … I hope you enjoy it … Next week – Feathers …. 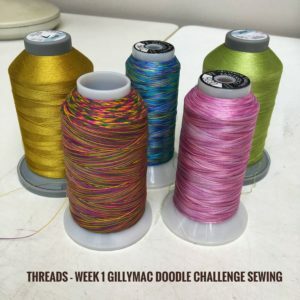 and also on Saturday (1st September), along with the final Sew Up, I will be announcing how you can get your GillyMac Doodle Challenge Pin and confirming the dates for what is next for those of you who have doodled with me this Summer – to qualify you to need have doodled for at least two weeks of the six weeks. Well done team !!! We are at Week 4 with two more to do. This week’s borders seemed to be welcomed as easier across the board – with a lot of love for the loops on Monday and my ‘lie-detector’ (too much ‘Homeland’) on Thursday. The sewing up this week reflects that these are border patters, or at least can be used in a linear fashion. 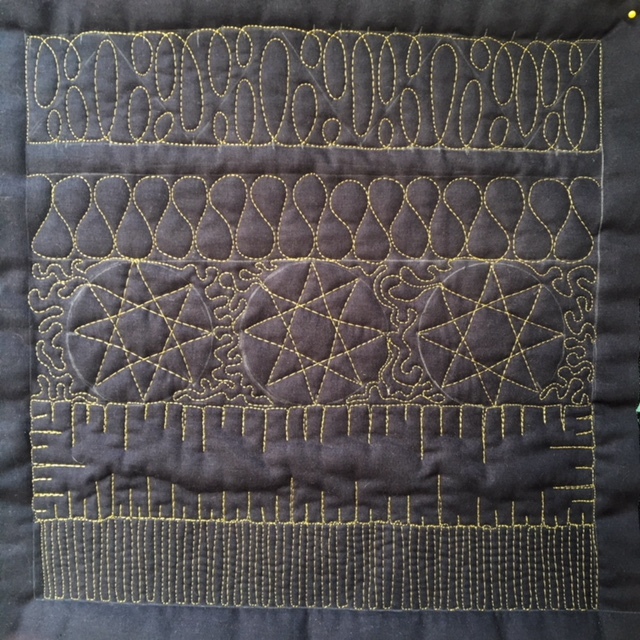 I really like quilting borders. 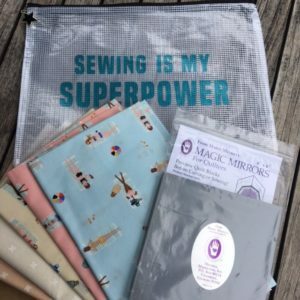 I think it means I am closer to the ‘Ta Dah’ moment of quilt completion … and also, typically, quilting the borders is easier because they are more accessible. So this week I have sewn up the doodles in rows, as I see you using them. Below you will find two videos and a downloadable document. The first one is the video you are now used to with me sewing up our doodles. You can choose how large each of your border rows will be. I started in the middle with the stars row and found something to draw around (baked beans tins are very useful) and then worked my row sizes out from there. The next video is information to help you plan for doodling and sewing up corners. Then there is a downloadable PDF document which goes with this second video to help you plan your corners. 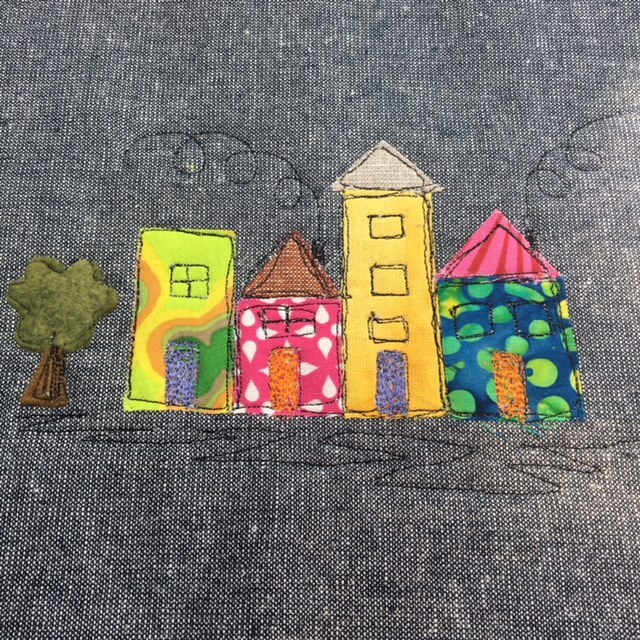 Next week we’re moving back to ‘all over’ doodle patterns which culminate in a picture to sew which is great fun. Then in Week 6, I will teach you how to doodle ‘bump-back ‘feathers and I know you will all love the sew up for that final week. A heartfelt thank you to all who are taking part in this challenge. Below is the video of the doodles being sewn up. 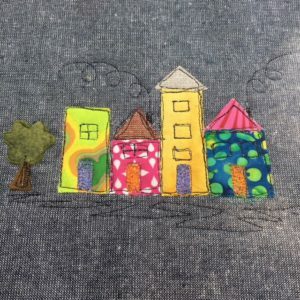 At the moment the most important thing is that you get secure in your doodles and if you want to practice them on the sewing machine, just ‘have a go’ with no expectations. I am sewing them on my sit down long arm, but only because it makes the videoing easier. 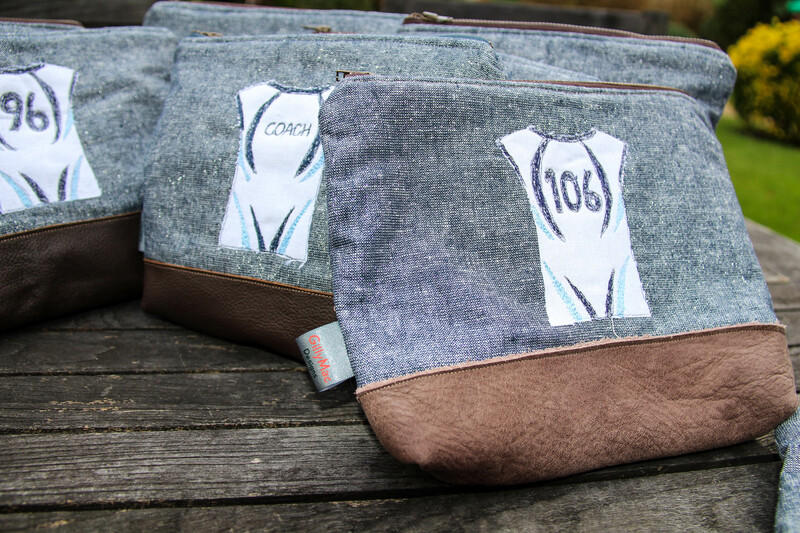 Everything I do can just as easily be done on a normal sewing machine. 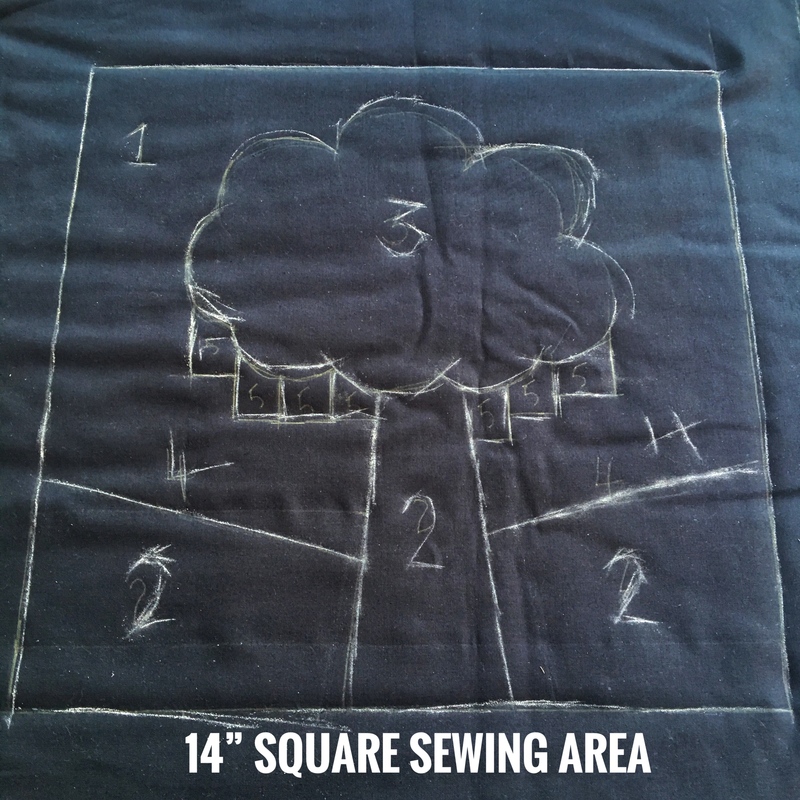 To sew the doodles up I used a wadding sandwich with a 14″ square drawn in it – which I filled with my doodles. 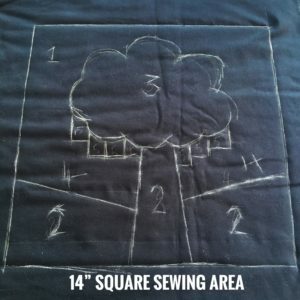 I made my square a little larger however a 12″ drawn square will be a better size for a book if that is your intention for the squares later :-). If you want to copy this, then the picture below will show you the designs I chose. 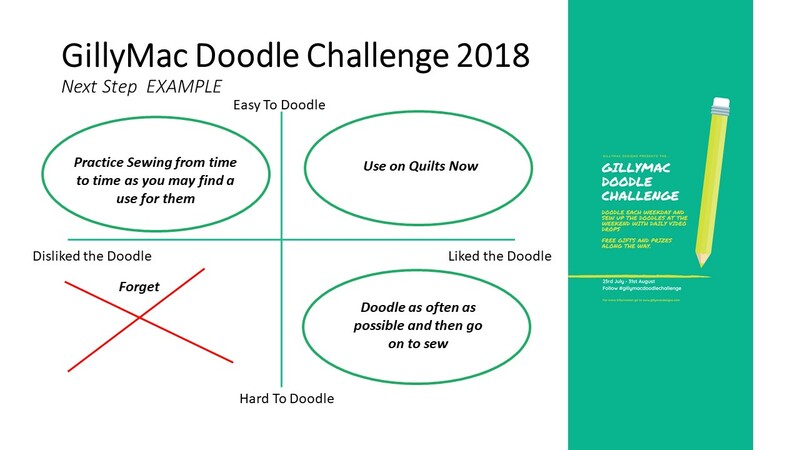 The numbers in the drawing related to the doodle day patterns I used in each section – so a label of ‘3’ means that I used the doodle from Day 3. The little boxes which are hanging from the tree are for the Day 5 Doodle. The other picture shows you the Glide and Fantastico threads I used. Any eagle-eyed person will notice the red (for the apples) isn’t in the picture, but it was also Fantastico. I have speeded up certain areas of the video so as not to bore you or be very repetitive.